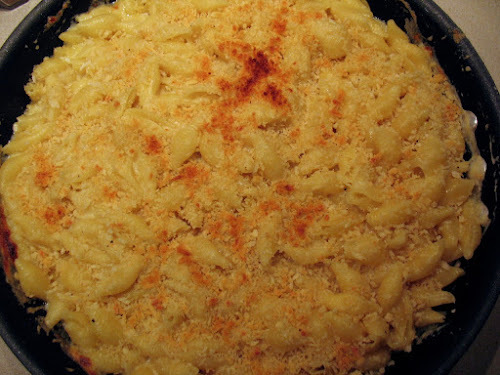 Macaroni & cheese is one of the all-time great comfort foods. What other dish, besides fondue, allows you to eat cheese with such decadent abandon? It's a versatile dish that recalls childhood but can also accommodate discerning adult tastes. For many people, macaroni & cheese means the Kraft boxed product. I wasn't raised on this, although I have had it, so I don't share the nostalgia for its neon orange glow and soft noodles. 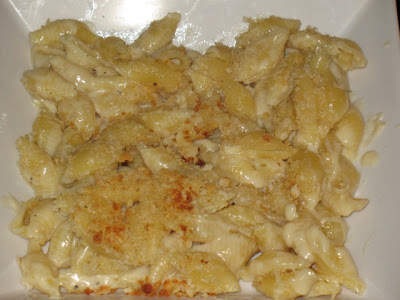 I grew up eating homemade macaronic & cheese made with real cheese and I prefer it that way. There are lots of ways to enjoy mac n' cheese, but this recipe below is a basic recipe (a variation for smoky mac n' cheese follows). Feel free to add meats (chicken or bacon work well), vegetables (asparagus tips, onion, mushrooms) and play with the combination of cheeses. Be careful not too add too much though, as the focus should be on the cheese and pasta. Although popular, I don't recommend adding broccoli to mac n' cheese. I think some people do this because they don't like broccoli and the cheese masks its flavor. But I happen to think that broccoli is good, and when you add it to macaroni and cheese, the flavors tend to cancel each other out rather than harmonize. The selection of cheeses is obviously very important. Because they're being cooked, it's important to choose very flavorful cheeses that melt well. Cheddar is an obvious choice, and I like to use a flavorful aged Irish cheddar which, although not labeled "sharp," certainly is so. 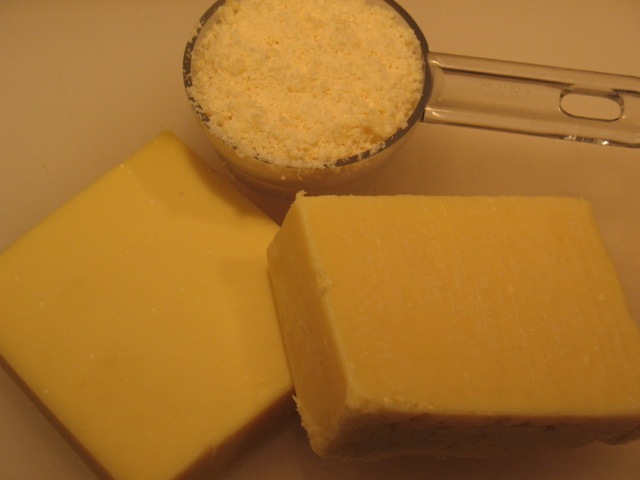 I also like to use aged Swiss gruyère, which we know melts well, since it's the principal cheese in Swiss fondue. Finally, I toss in some nutty parmigiano-reggiano. This combination makes for a seriously rich, nutty cheese sauce that also melts smoothly. To add a little flavor, I like to have some garlic in the sauce, but not too much. I've found that adding a whole minced clove is overpowering (especially if you eat this as leftovers), so I borrow a technique from fondue-making and rub half a cut garlic clove all over my frying pan before beginning the sauce. The sauce itself proceeds in three steps. First step is roux, a sauce of equal parts flour and fat (in this case butter) that is cooked to eliminate any raw flour flavor. I cook this to just a light brown, not too much. 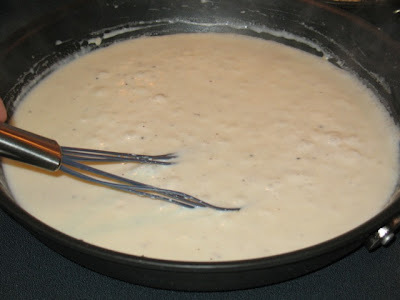 A flat whisk works best for making cheese sauce. The next step is to whisk milk into the roux, which produces Béchamel, one the five "mother sauces" of classical French cuisine. As it cooks, the sauce will thicken, signaling it is ready for the cheese. 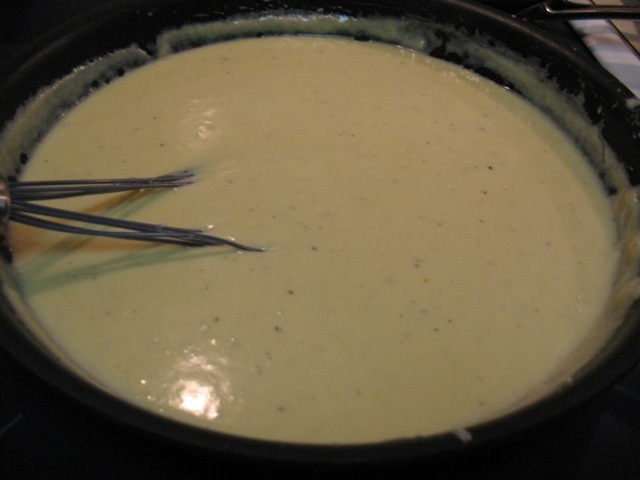 The last step is adding the cheese, which turns the Béchamel into Mornay sauce. Who knew all these French cooking terms would be applicable to Macaroni & Cheese! For the pasta, any stubby pasta shape will do. Elbow macaroni is traditional, but small penne, farfalle or fusili will work too. Lately, I've preferred medium-size shells, which have cavities that easily fill with cheese sauce. For a final flourish, I top the pasta and sauce with buttered panko and broil it until lightly browned, giving the macaroni a nice crunchy topping. Some recipes call for actually baking the whole thing, but I don't see how that's necessary as I suspect it would just dry it out. 1. Boil pasta in salted water to al dente according to package directions. Drain pasta and set aside in large pot. 2. Melt 1/2 tbsp. butter in a small frying pan over medium-low heat. Add panko and stir to coat panko with butter. Remove from heat before panko browns. If desired, sprinkle with paprika. 3. Rub a cut side of 1/2 of a garlic clove all over an oven-safe 12-inch nonstick frying pan. Heat pan over medium heat. Melt 2 tbsp. butter in pan. When foaming subsides, sprinkle with 2 tbsp. flour. Cook, stirring with flat whisk, until lightly browned. 4. Add 2 cups whole milk to butter/flour mixture, whisking to incorporate. Increase heat just past medium and cook until sauce is lightly bubbling and thickened. Season with nutmeg, seasoned salt and fresh-ground pepper. 5. Reduce heat just below medium and add shredded and grated cheeses, a handful at a time, whisking to incorporate as cheese melts. 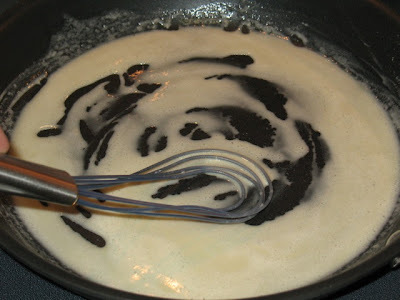 Pour sauce over cooked pasta and stir to combine sauce and pasta. Return sauced pasta to frying pan and sprinkle buttered panko evenly over pasta. Preheat broiler on high setting and broil pasta in frying pan about 6 inches from broiler until the panko topping is lightly browned. 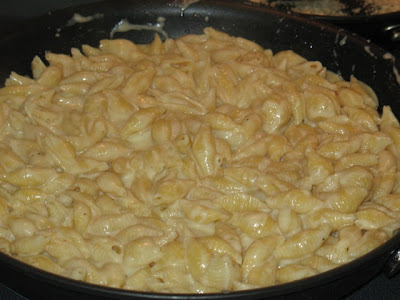 Growing up, my mom often served Kraft (although she would also make "real" mac and cheese on special occasions). I'll confess to having nostalgia for the Kraft version, although it would surely pale in comparison to your recipe! The only time I ever had boxed mac & cheese as a kid was once at a friend's house. I made it a few times in college too. Last time I had it, I thought it tasted like lemon juice.